We help sales teams stop selling and start solving for their clients. Mon.grel: Often used to describe a mix of dog breeds. Any cross between different types of things. Meth.od: Orderliness of thought or behavior; systematic planning or action. Mongrel Method: A mix of sales and marketing to engage the new breed of buyer. By the time the client engages directly with the sales team, they are half way through their buying decision. Opinions are formed and strong biases have developed. The way people look for information to support and inform their purchasing decision has shifted. The smart phone and online communities have changed the game. Sales and marketing have come together; marketing is no longer an art but a very accountable science in the same way sales is accountable. The Mongrel Method is a practical and memorable delivery of the skills — and more importantly — the actions for today's sales and marketing teams. 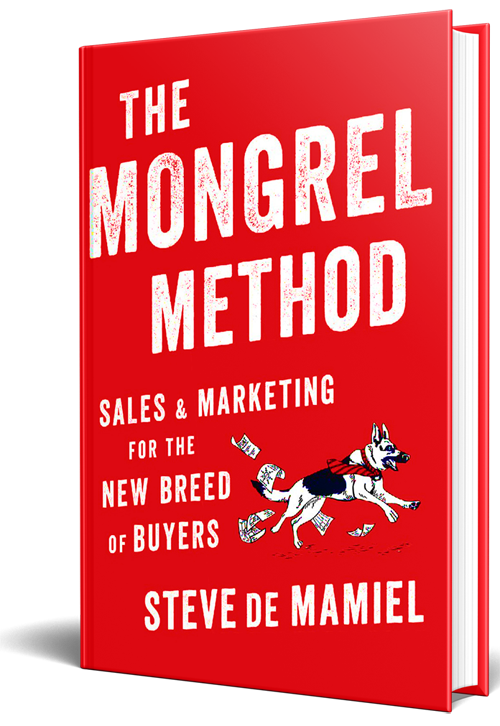 Inspired by Steve’s years of experience coaching this subject—and his dog—The Mongrel Method uses anecdotes about Samuel, as well as real-life examples, to guide you through Steve’s mixed-tactics approach to sales and marketing. Steve explores the importance of today’s techniques like big data, analytics, personas, micro-moments and automation. He demonstrates how shifting your focus to client intent, social listening and community marketing will help build understanding of your customers’ needs. A purebred, or one-sided, approach to sales and marketing won’t help you achieve success. A mixed approach is best.